UK Mug Swap Link Up! Hello fellow Mug Swappers! I hope you've all had a great time swapping mugs, hopefully getting to know eachother and having fun! 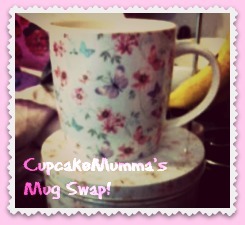 I've really enjoyed hosting the Mug Swap and hope you've all enjoyed taking part. I know some mugs are still in the post so I'm opening up my link for submissions for a few weeks to give everyone some time to share their gifts. I've seen a few posts as I've gone through my blog roll and I'm really looking forward to seeing everyone else's. All you have to do is write a post showing off your fab new mug. Post the URL of your Mug Swap post along with your name so we can visit your blog and share our swaps. Thanks for joining in! 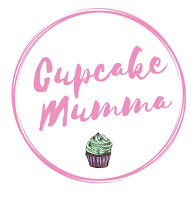 Please let me know what you thought of the swap and if you'd like to see another hosted on CupcakeMumma again next year! Ah finally I get a chance to blog about my birthday. 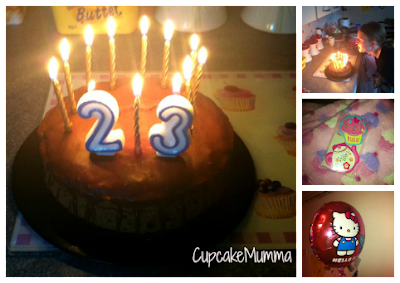 I turned 23 on Monday and had such a wonderful day. I was all recovered from whatever horrible illness I had a few days previous (much to my joy!) I had nothing planned, just a nice, normal day with my family to start half term. I was woken up at half 6 by Midge. This is too early for me and she knows it by now! I felt her snuggle up beside me, then half an hour later Daddy brought up some presents. I had lots of help from both Midge and Little Man that morning. Here's Midge showing off the lovely cushions she helped Daddy find just for me. I opened one other present before breakfast which was a really, really pretty necklace I had spotted when out shopping in a local charity store. Now, some people may pull a face at a thrifty find being given as a gift, but I could not have been happier. 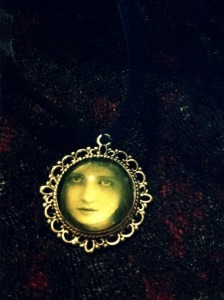 It smells so old, it's from Spain and is also a locket. Thank-you Dearest! A really, gorgeously soft pink blanket covered in cupcakes and 2 cupcake note pads from the lovely Kat who blogs at Kat A Pillar. 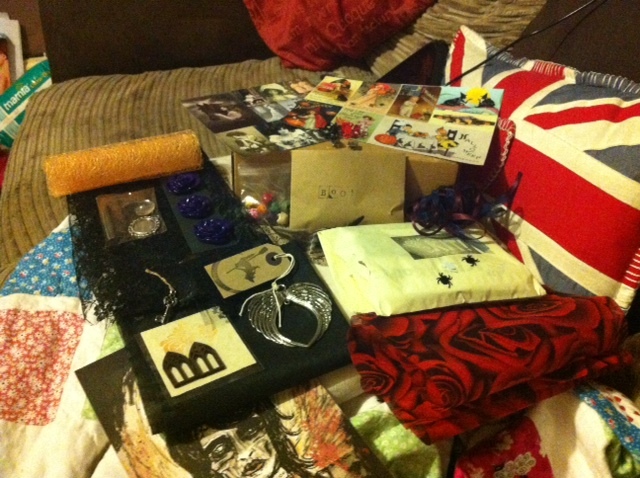 Thank you so much Kat, my gifts are fab! My Hello Kitty balloon that Midge insisted Daddy bought for me...I'm thinking it was more for somebody else though! 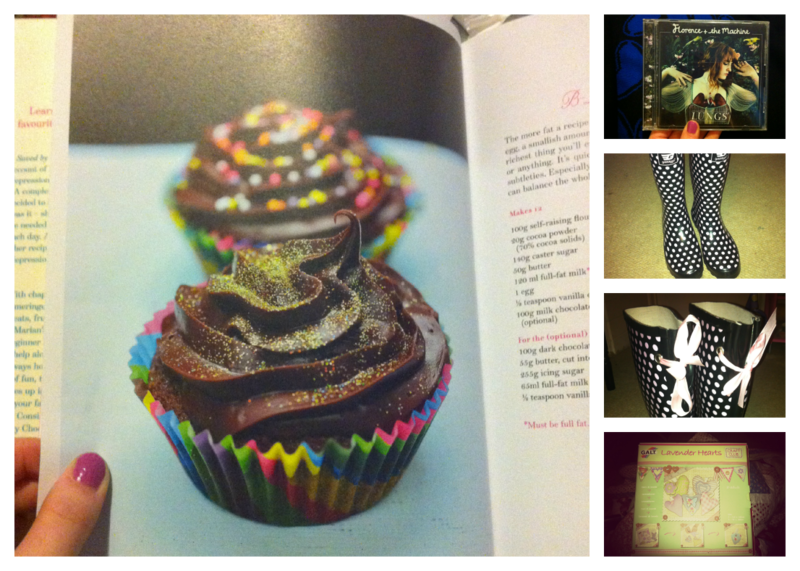 I received a lovely cook book from Husband as well as a Florence and the Machine CD with our wedding song on and the prettiest wellies I have ever seen. Seriously, pink polka dotted wellies with ribbons on! I was seriously spoiled this year. To add to my list I received: some rather tasty smelling bath bombs, a new sewing machine (thank you family!! ), chocolate, a lovely onesie from my sister so now I have 2 which is ace, a lovely new jumper with some new pajama bottoms and my sister-in-law bought me this great little kit to make your own purse. I'm half way through and can't wait to finish it so I can show it off! I had such a wonderful day and I got even more than I have written. I do love a birthday! Look out for my new blog post on our rather awesome Halloween party that we've literally just finished and also my Mug Swap link up party! 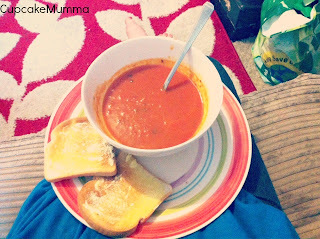 Poorly Tummies, Birthday Prep and Half Term! Hello! I am back after a fair few days of being quiet on the blogging front. I was very unwell last Thursday. It all started off at midday just before I was due to leave home and watch Midge at her Harvest Festival when I developed a terrible pain my stomach. Because it was such bad cramp I figured it was something to do with my IBS, took a few remedies and went to watch Midge perform anyway (I wasn't missing it for anything!) The que to get into the hall was huge, Mum and I were very lucky to get a seat (even if it was just the end of a bench!) We were right near Midge who was desperately looking out for us in the crowded hall. Her Harvest Festival was really brilliant. I videoed it for Husband and her Nanny who has just had an operation so was unable to come and watch so I don't have any photos but what I did snap a shot of was her fantastic drawing on the 'Dazzle Board.' 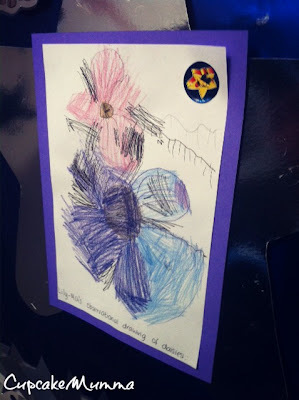 She was put on the board for her great piece of work on observational drawing. Definitely another creative little person to add to the family! Unfortunately, when I got home my cramp and sickness become worse. Husband went out to get some special tablets for me to try which helped a little. My Mum, in the mean time, had to go and do some of my weekly shopping! Midge tagged along and Little Man was napping. I spent the rest of the night clutching my sick bowl and feeling sorry for myself! By Friday I was shattered and mostly slept. I managed to eat a little as the day went on and saw Midge off for her last day of school before the Half Term. I'm really looking forward to this Half Term as we have our Halloween Party and I promised we'd go swimming too. Midge had a great time at the after school monster party and came home loaded up on sugar! (Thanks staff!) Husband took another day off work as I just couldn't keep my eyes open. Later on in the day Husband left for football so I took Midge and Little Man to Penzance on the train all by myself! Little Man was pretty ratty and ended up sleeping on me as we traveled home. Midge developed another earache but was really well behaved. I bought a few more Christmas presents which is the main reason we went over there in the first place so I was pleased. In other news, it's my birthday tomorrow which I'm really quite excited about and I just know I'll blog about it. Husband has been swearing as he wraps gifts in the kitchen and has baked me a delicious smelling chocolate cake (with a little guidance from me of course) By the looks of things I've been a little spoilt this year but I'm always grateful whatever I get. I'll be seeing my Gran and Aunt in the early evening before the children go to bed and my parents will spend some of the evening with me as Husband works in the evenings not returning until 11pm. 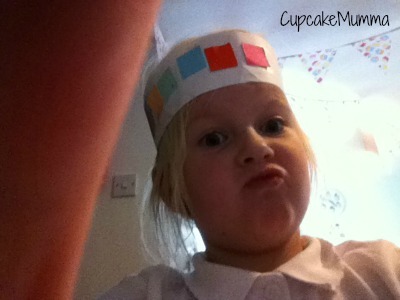 Recently I blogged about Crafty Creatives. I get a box of surprise crafty items each month and it is honestly the highlight of whichever day it happens to arrive on! This months box is all Gothic themed in honor of Halloween (which i love) so I dived in on Friday evening and started making things! On Saturday evening I pulled all the tape off and tried peeling the clingfilm from the netting as instructed. This doesn't actually work very well (and I'm not the only one who this happened to!) so I just left it on and cut carefully around the mask. I made a hole either side of the mask and husband tied ribbon because I was struggling with my child sized head shape! As you can see from my photo I made several other items too. I really wanted to do something with the pretty resin roses so I thought I'd do the most simple thing and make myself a very bold, statement piece of jewelry I peeled off the rose, chose the black blank ring and grabbed my super glue! It's all stuck on very well and suits my hand just right. 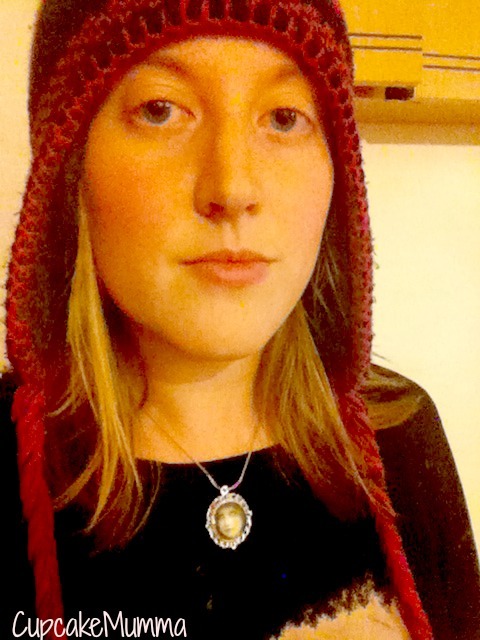 My last craft was making myself a new necklace. 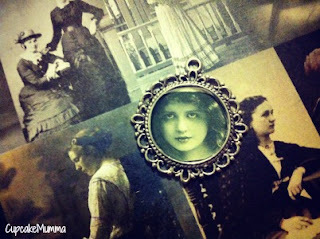 I took the cabochon and placed one of my favourite images from the vintage papers supplied into the pendant. I then glued the top on which magnifies the image. It looks spooky. My husband asked me to take it off when we went to bed because it freaked him out! Personally I love it and I shall definitely be breaking it out for Halloween. I was going to use ribbon but found an old necklace (I collect ugly ones from charity stores so I can reuse the chains) and popped the cabochon onto the silver chain instead. What do you think? There are still a lot of things to make from this months kit but I just don't have the time right now. I'm still making things from last months kit as well! If you have subscribed to Crafty Creatives then i'd love to know what you think of my makes and what you plan to do with yours! If you're here looking for answers, for an amazing new product or some revolutionary piece of advice, then I'm sorry, but you're out of luck. However, if you're here because you've just had the night from hell then please, take a seat, have a cuppa and know you're not alone. Last night my Little Man (who is 20 months old) cried and cried and cried. He cried from 9pm until 3am. We watched Charlie and Lola 3 different times. He was offered milk which he refused and offered it again later which he drank. 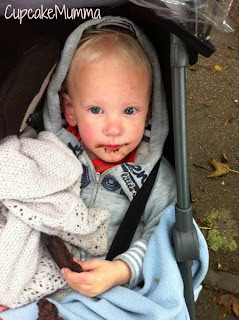 He had calpol. Lots of hugs, 'shhh'ing and pacing was done both by myself and my Husband. Neither of us could settle him. He wasn't wet and hadn't soiled his nappy. He is teething and he was over tired. Actually he was past over tired in all honesty and just wouldn't let himself go. His head touched the cot and he screamed. We tried the ever controversial control crying. That was useless with my Midge who didn't sleep through the night until she was 2 and a half years old (I know, hold me) but it has worked with Little Man in the past when he was being a little bit cheeky with his sleep. This time he wasn't being cheeky, or stubborn. There was something wrong and something I couldn't do anything about. We got to the stage where the crying was too much and of course the Husband and I started to feel the stress and had a few cross words. Let me tell you something. When people are tired they can say the most horrible things but you must try not to bite back. Usually I'm pretty bad when it comes to arguments but last night I bit my tongue and knew it was just the heat of the moment, the awful stress and the crying just going through the both of us. In the end, after Little man had sat up with Daddy once and then a second time being pushed too and fro in the front room in his stroller (after this all options were exhausted) he fell asleep. He woke up again however headbanging (which we're no stranger to). At about 3am Husband finally came to bed after insisting I grabbed a few hours because I had to get up with Midge for the school run. 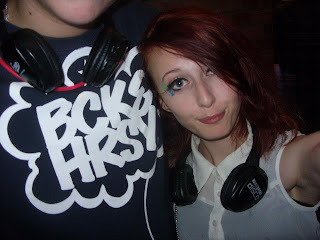 It was at this hour he asked me for a hug and apologised for anything he said. Of course I accepted this apology and told him it was all okay. Luckily, Little Man stayed asleep from that moment until 10am. I did the washing up, made Midge's Harvest Festival costume and tidied a bit before Husband got up at 9.30am. We managed to have a good day today which makes everything better. I am absolutely shattered but have managed to do the housework, homework, blogging and even cooked myself a decent dinner. No I don't want an award, I'm just surprised at myself. Last night I felt like leaping out of my window and running away (if I could, what with the broken ankle I'd be sure to end up with!) I hate that feeling of intense desperation that engulfs me when I hit a point of exhausting all avenues. I felt awful that my baby was crying at me and yet I couldn't do a thing to make him better. Ultimately I know these nights are few and far between (at least I hope!) after being there with Midge I really don't want to go back there with Little Man. Lack of sleep reduces you to a miserable, anti social wreck. I'd go as far to say that when I was in that phase with Midge, I didn't even want to be here anymore. Honest. Hopefully tonight will be a better night. We are calpoled and Anbesoled up, we are warm and cosy and clean. We have Vicks on the radiator and have had a decent routine to our day with a bit of fresh air too. Sometimes there's just nothing you can do. I wouldn't have been able to get through last night without my Husband. He really is my rock. If you're having trouble with a sleeping child I can really offer you my full sympathy! You are not alone in the slightest. 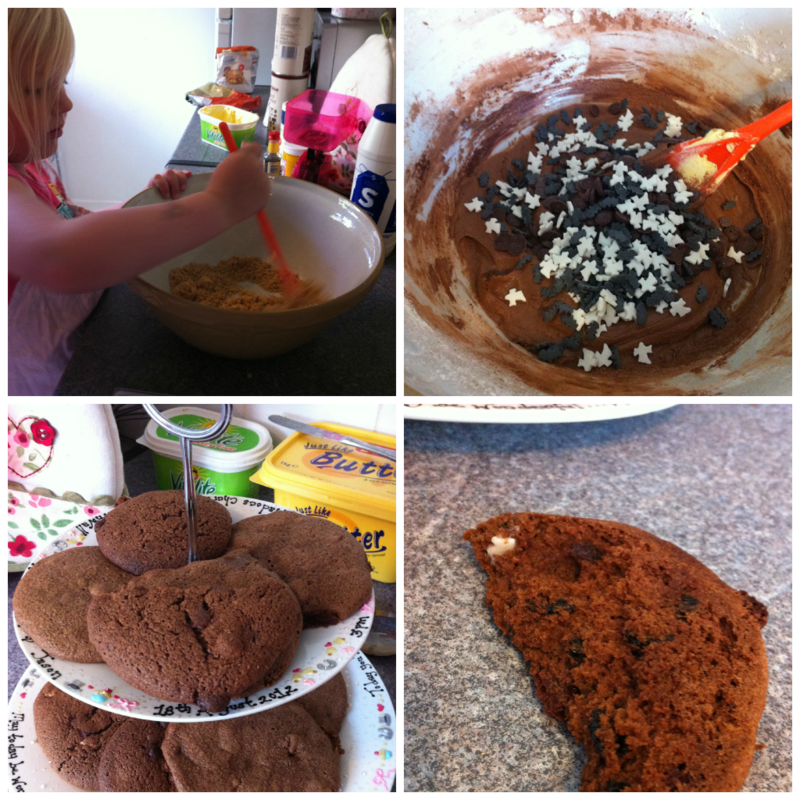 Midge adores baking and is always asking to make cupcakes but at the moment I'm loving my cookies. We added chocolate chips and Halloween sprinkles to our cookie mix this time and have decided to make some more for our upcoming Halloween party! At 12 0'clock on a Saturday, Husband always leaves for his football match. For the second week in a row the team were playing a home match so I thought I'd wrap us all up to go and surprise Daddy who had no idea we would be coming to watch him play. The walk to the park where he plays football is actually quite a nice walk. We usually just walk into town or to school so going somewhere new (with a park) is always a nice thing to do. Midge took her scooter while Little Man played with a huge leaf which had fallen from a tree. The leaf is bigger than his head! 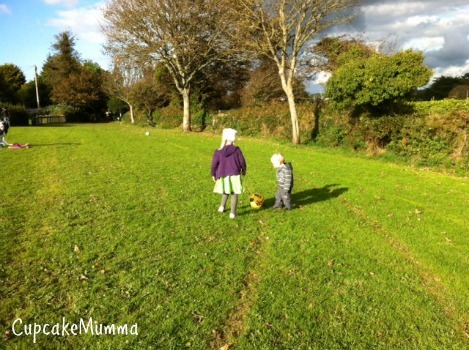 When we got there, both Midge and Little Man grabbed themselves one of the teams footballs and passed it to each other. Husband is very pleased they both seem to be showing an interest in the sport! 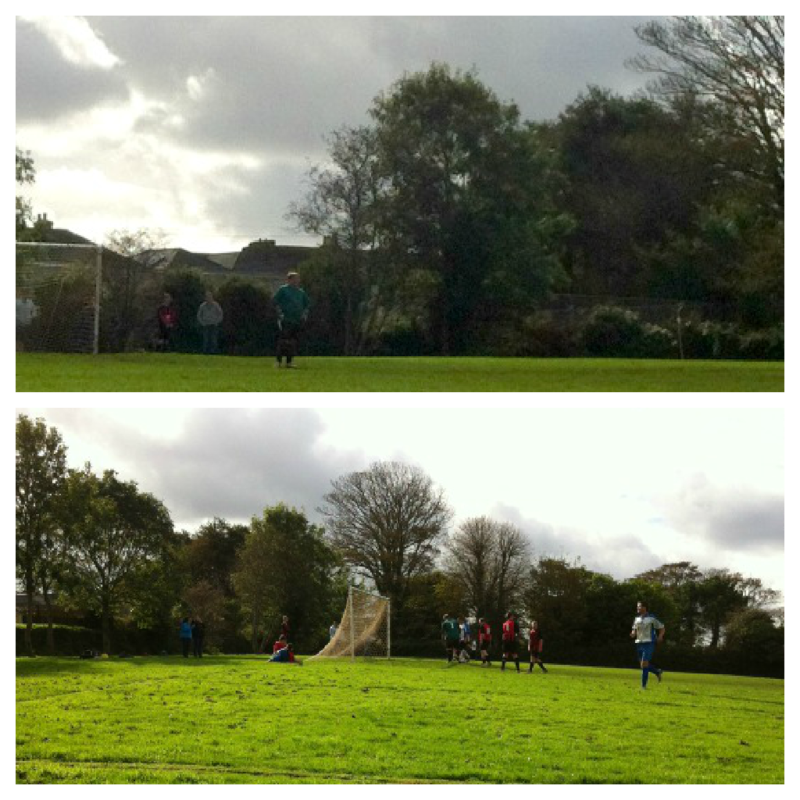 Sadly, their team didn't win but we all had a nice day anyway. You've got to love them right? I hope everyone had a good weekend whatever you got up to! I dropped Midge off to school this morning feeling slightly anxious. My stomach was doing a few flips but we chatted all the way about what she was going to do today and all the fun she'd have learning some new things. I kissed her goodbye as I had to be somewhere. For once I wasn't going back home to my Husband and Little Man to sort out the house. Nope, I was going to be alone. For at least 40 minuets. How wonderful to have 40 minutes all to yourself you might say...it would've been great if it wasn't TO THE DENTIST. Anyway I digress...Sure, I got to sit in the waiting room for 20 minutes because I was really early. I figured there was no point going home only to come back out again. I got to read Cosmopolitan (which was dated May 2012) no matter, I never read an in date magazine at home anyway. Then my name was called. I was only there for a further 30 minutes in which I was poked, prodded, stabbed* with a needle (twice), had cotton wool and horrible molds put into my mouth before leaving with one real and one temporary filling. My first proper fillings. Not bad for nearly 23 really, just something that happened. I shall be more vigil with my tooth brushing now. I should floss apparently, which I hate but I'm not going through that again! I'm now sat home, anaesthetic wearing off and my gums returning to normal. They sting a bit and I feel so, so hungry. I have another hour before I can eat anything but my porridge is all ready to go! Nothing better than porridge to fill you up and keep you warm on a chilly Autumn day. I think I may also pop out later and do some early Christmas shopping with my newly arrived Park vouchers. I should be grateful i got out without 2 children screaming at me, saying they're bored or just whinging for the sake of whinging. I got to read a bit of a magazine (granted, it was old but who cares?) But I would much rather my next spot of 'me time' is more relaxing. Although, I did like being called 'Mrs Brooker,' makes you feel rather grown up this 'Mrs' business! I have seriously been waiting weeks for Crafty Creatives new box full of goodies to arrive and finally today was the day! With an immense Halloween theme there is so much potential for amazing things to be created! Opening this parcel was like Christmas had come early! There's fabric, cards, kits, rings and so much more. Best £10 I spend each month I'm telling you! Gothic windows from America and a silver wing pendant which I think I'll make into a simple keyring. There are also 2 keys and non woven fabric which is really easy to work with. 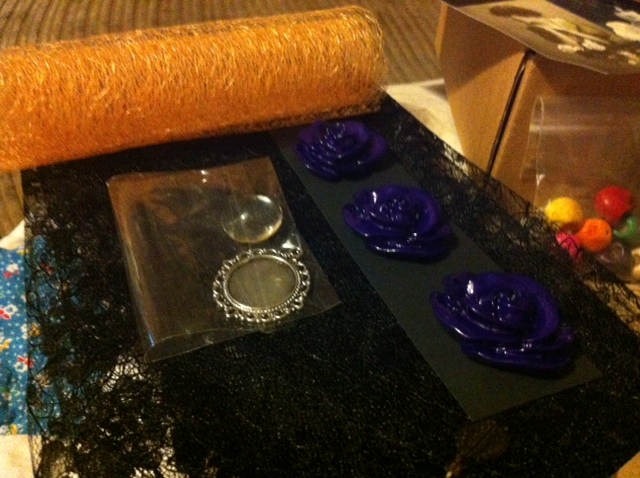 Black lace which is just gorgeous, 3 large, purple resin roses which I have plans for. There is some spider web mesh in a lovely golden colour which is great for both Halloween and Autumn and a glass cabochon which I have never actually seen let alone use but it will become a lovely necklace. 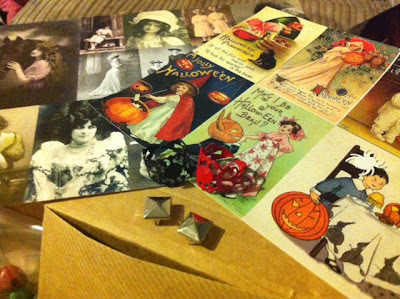 In the 'Boo' envelope there is a handful of studs which can really punk up any fabric. Those colourful skull beads are just great aren't they? I'll be making them into a piece of jewelry as well. 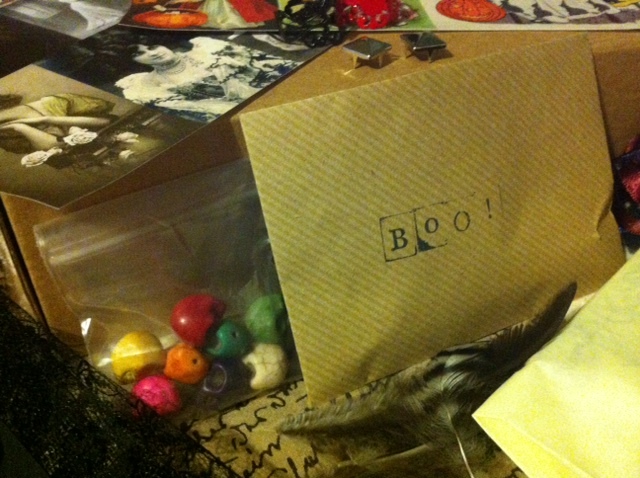 There were some feathers and pictures which are Halloween themed and vintage. Nice touch. Here you can see the cards better. I love the Halloween one so I think I might be able to use them on cards as little mementos for the children who are coming to our Halloween party. You can also see the 2 rings which actually look pretty cool on their own but as they are blank definitely need that 'something.' I have ideas but need more equipment! 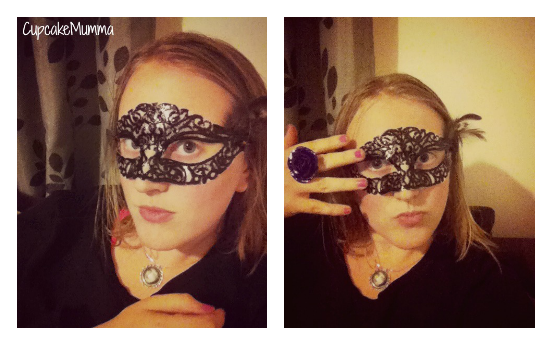 What I didn't take a photo of is this months kit which is a rather fabulous masquerade mask! We have been provided with a template, fabric paint and ribbon. All I provide is the clingfilm which I'm happy with! Look out for this make soon! 1) A cat. I've seen this listed a lot actually and it's really not surprising. I would say a cat is my favourite animal. Hopefully I'd be in a really nice home where i could sleep and eat and come and go as I please. What. A. Life. 2) A star. I sort believe we already become stars when we pass away. I sort of hope this is true I mean, what a view! It would also be very sweet to be pointed at like we do with Midge and say 'Super Nanny is a star in the sky,' It would be quite nice I think. 3) A very much loved teddy bear. I would travel everywhere with my little companion and get to sleep in utter comfort knowing how loved I am. When my companion grows up maybe I'd still be kept on a shelf or something or maybe passed on to be loved again? It's a nice idea! 5) A Penguin. I know I hate the cold but if I was a penguin I really wouldn't care. Or maybe I could be one in a park, after all, the penguins at Paradise Park seem to be happy enough..they get fed fish, dip in and out of the pool as they like and people love them. Who doesn't want to be loved? I have come to witness a fair number of amazing things happen over the course of this year and I feel like I've really got something to look back on. When my children have children I'll be able to tell them about the time I watched the Olympic Torch travel through a local village and I got so close. Then I'll show them the photos of the amazingly patriotic event. Then there was the actual Olympics which isn't going to be happening in this country in my life time again (or until I'm very old if lucky!) Granted, I only watched it live on my television but I still felt a part of something. If I was there it would've been the most incredible atmosphere but everything and everyone would've been tiny little dots whereas on my TV I saw every little detail. I felt truly proud to be British on that day. 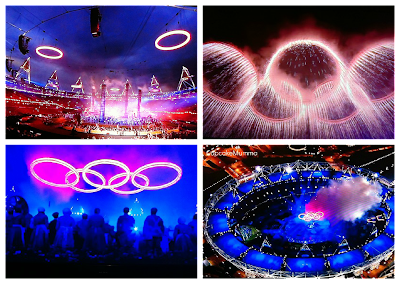 Then tonight, well there was only word for what I was watching live on TV tonight and that is: WOW. 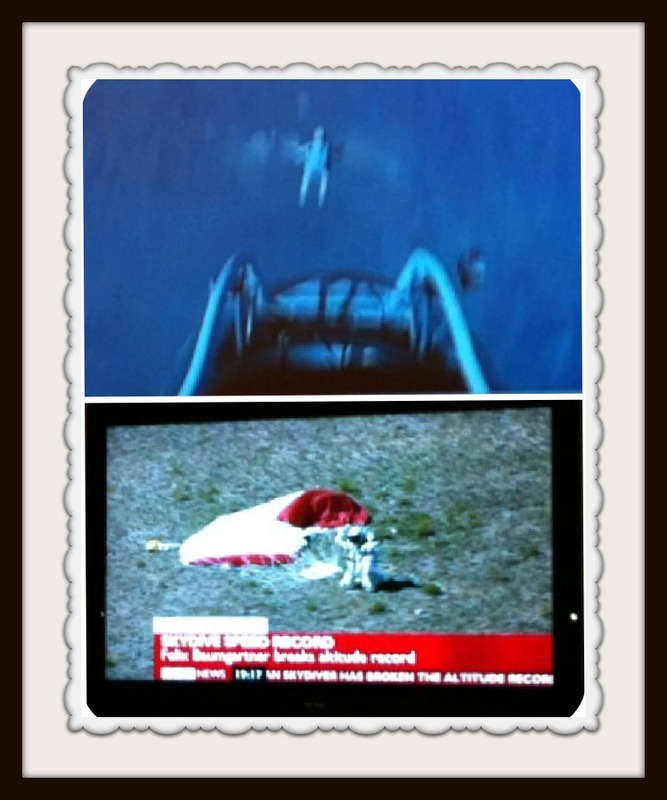 Felix Baumgartner has skydived 24 miles from Earth and it was AMAZING. My heart was thumping watching him go down, especially when he started to turn a bit. He landed like he had just done a run of the mill skydive and not a record breaking jump! They are appalling quality photos but hey, I have those photos now and with them the memory of history in the making. It's a very cold evening here in Cornwall so I'm typing this under my lovely quilt on the sofa! The whole week has been pretty cold, winter is on its way. 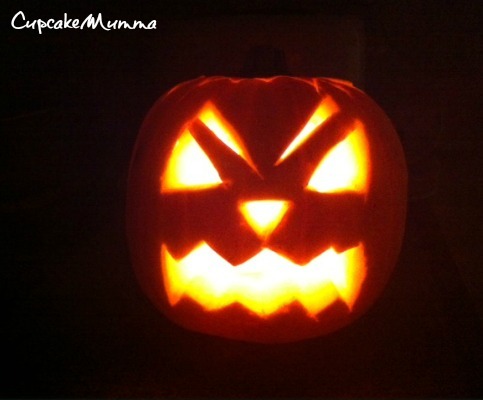 This week I've been doing crafting and planning our upcoming Halloween party which I'm looking forward to! Midge has had both a golden ticket at lunch time for observing the school rules (she got the ticket for her manners) and also received 'star of the day' on Tuesday, so I'm a very proud Mummy. Today her class celebrated all things French. 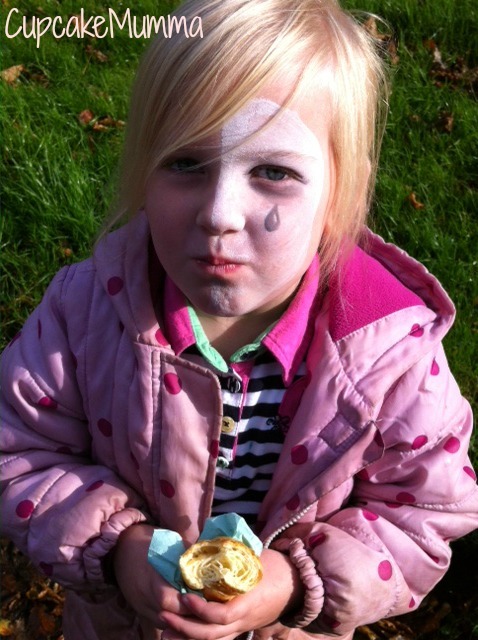 She came out of school with her face painted as a mime artist and her little hands clenching a chocolate chip croissant. She's always refused to eat them but seems to have found a love for them...I bet she doesn't eat the ones I've bought from Iceland earlier! Little Man has been on some growth spurt this week. I'm not sure what I've added to his milk but he's just shot up out of no where! He's dancing around and making his Dad and I laugh so hard. He was amazingly good at the dentist receiving a sticker for having very clean and healthy teeth! He's added 'Uh, Oh' to his cute vocabulary as well as more normal words such as 'Daddy' and 'Bye.' I'm loving every moment of watching him grow and thankfully I'm not finding it too fast. I recently received a craft box of goodies the other day so started on my first make which was a little notebook with instructions on how to do Japanese Stab Stitching. I found this a bit fiddly but overall I'm very happy with the result! Midge helped me by pulling the thread through the holes. Tomorrow, the Husband has a football match which I would go and watch with the children but I'm a bit worried about the weather! I think we'll go for having a nice lay in, baking a hazelnut and chocolate cake and finishing my November Thanksgiving Calender with Midge. Hope you've all had a great week and have a wonderful weekend. I took up a crafting challenge this week to make something using Washi Tape. I'm very new to Washi Tape (I let it all by pass me and decided not to bother getting into the hype) but I think I may have missed a very good crafting item! Until now anyway.. I took a long photo frame from my storage cupboard which had gone unused and ignored and started to tape over the wooden frame. I had already made these hearts from a magazine last month. They were going to be bunting but I wanted to be more creative. I stuck the polka dot tape over the board and super glued the hearts leaving the glass off. For my first attempt at using Washi Tape I'm very pleased with what I have made. I was going to put it in the children's bedroom but it actually brightens my hallway up so I'll leave it there. Is hard right? I don't have very many friends (my closest is actually my pen pal which doesn't bother me in the slightest!) I do have friends locally. They're more of the 'swap the children for dinner nights and catch up at a children's birthday' kind of friends but hey, there are a lot of birthday parties so there is plenty of time to become firm(er) friends! Anyway, as I was saying, I don't have many friends especially Mum friends. It doesn't really surprise me in total honesty because I've stopped going to baby classes. It's only recently I've been thinking that Little Man could be missing out on some one on one time, some cool toys and some company of his own age- but these groups are so off putting to me! If you're brave enough, you'll start the conversation and usually a good way is by complimenting their baby right? Or is this just me? I genuinely mean my compliments ('Oh how sweet' 'Oh gosh isn't he tiny?' or 'I love her dress,') Mums love little things like that don't we? Those few little words can create a small gap for further conversation such as, 'how old is he then?' you get the idea. Often I can see that a lot of Mums aren't really up for this 'getting to know each other' lark and as soon as their little clique or buddy comes a long you've got no chance. I usually wait for Little Man to get up to no good at this point because it means I can get up from my awkward patch and 'tell him off' when really he's just saved me from being a total loser talking to nobody. See, that's how I end up feeling at Mum and baby groups: A loser. I know for a FACT I'm not the only one who feels this way. Perhaps some would say it's my attitude? That I allow myself to feel this way? Then again, I don't know many people who can just walk into chatting circle of Mothers and feel able to strike up a conversation. I always feel like I try first, with a smile, then with a little small talk and yet still I never seem to get anywhere! I've come to the conclusion after writing the above that I WILL start attending toddler classes again but with a new attitude. I shall adopt the 'i'm here for my son,' attitude whilst remaining happy and friendly towards others. I suppose it would be an undetectable 'take it or leave it' attitude which means we can all leave at the end of the day happy. I could gain a mate or two or just leave with my little boy who has had fun and bonded with his Mummy for a few hours. 2. Children really do ask you some interesting questions. 'Mum, where does water come from?' Good question Midge, let me briefly pop back to 2004 and pretend I was listening in Science because, lets face it, there is a proper answer here! 3. Oven jacket potatoes ain't all that and a bag of chips...Or i'm just doing them wrong. 5. I owe £6.80 to my local library for a book I cooked from twice and then forgot to return. Serves me right really but how bloody long have I borrowed it?! I'm sure it wasn't that long!! 6. That you can't remember everything. I forgot 'Show and Tell' today but in my defense i did remember letter writing, math homework (early), £1 for the Halloween party and to bring a drinks bottle to class! It's been a long old day. A boring one at that. I used to drive my parents mad when I would spend every hour of the day announcing just how bored I was and now it would seem I'm starting to drive myself mad. I guess I just didn't really know what to do today. Husband and Midge had gone out, Little Man was really sleepy and still not feeling all that well so I just popped him to bed. I was lucky that my mother in law dropped over with an old case of beads and sequins so that took up some time. I then Skyped my sister which is always an event. It went well until the sound delayed and the webcams were blurring up. 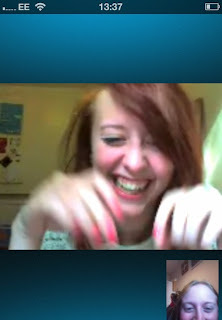 We had a brief catch up and it's always nice to see her happy so that was a good half hour or so. at my ugly mug! Just couldn't not laugh! Then nothing. Just sat there on my arse doing nothing but watching friends and eating soup...which was delicious. I don't know is that just a good, old fashioned lazy Sunday? Maybe Ive become so uptight I can't even relax properly? I just feel I shouldn't be relaxing. That there's always something to do but why not just sit there and not give a hoot? I was thinking the other day,(actually it was 2am and I was talking to my husband) just how laid back we were only a few years ago. The town changed us into something we've never been before: a pair of uptight, stressed out morons not thinking to just live like we used to!! We used to have a massive box of a tele, a playstation 2 which was hardly played and a tonne of paints, paper and books. We read, we used the TV for a bit of In The Night Garden and as a radio. We had a laptop which I used to go on forums whilst I was trying to conceive and to catch up with my friend by e-mail (as I had a normal phone, pay as you go, lived in the middle of no where and had no credit with crap signal) we were so HAPPY. There was the smallest patch of front garden Midge used to burst onto totally starkers. We walked the woods, cycled to the beaches. I miss all of that. I miss the old ladies and our once a week trip to town to buy our groceries (which we were strict on) I miss painting with Midge and not caring about mess and neither would her Daddy (he gets really miffed about stuff on the carpet). 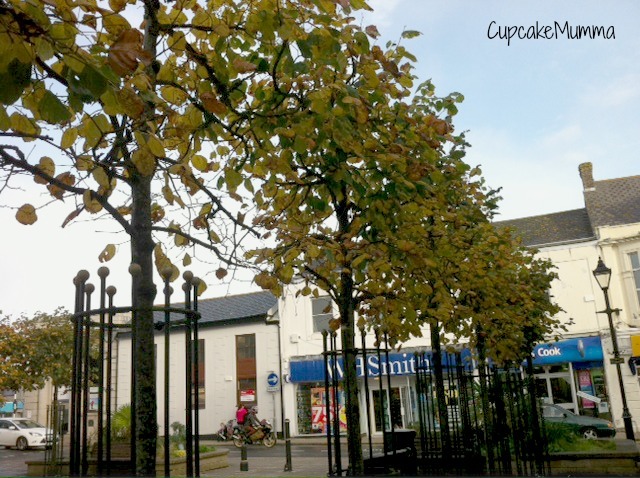 I find the town so useful and it's such a wonderful place to be for doctors, schools and shops. I can walk everywhere which is good because we'll never afford a car! But I feel like I've built myself a mini prison. I hate baby groups, I have to take a bus to any decent walks because they're just too far with the kids, I've even looked into Geo-Caching which looks like great fun but there's only a few nearby and after that it's just shelling out money I don't have on transport to get me as near as possible to some box! I think I need to think this through some more...I''ll let you know how I get on! Looking at you now, pulling my cupboards open and emptying my (expensive) cereals onto the bathroom floor, putting crayon on my kitchen wall and running around like a loony I can't believe I actually have these sorts of photos in my collection. 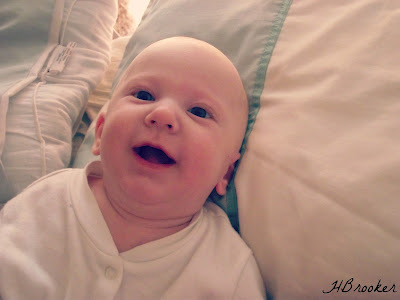 These photos remind me just how much you've grown (especially with 4 months until you're 2!) where you couldn't lift your head up, you'd cuddle up quite happily for as long as hour and I had to do everything for you. Now I don't hold your bottle, have to pick you up when you roll on your front or even fall over! You pick yourself up, brush off your hands and carry on walking. Just like that. I'm not even allowed to help with your food most days! At least you let me (most of the time) hold your hand when we go for a stroll through the town and to the parks. 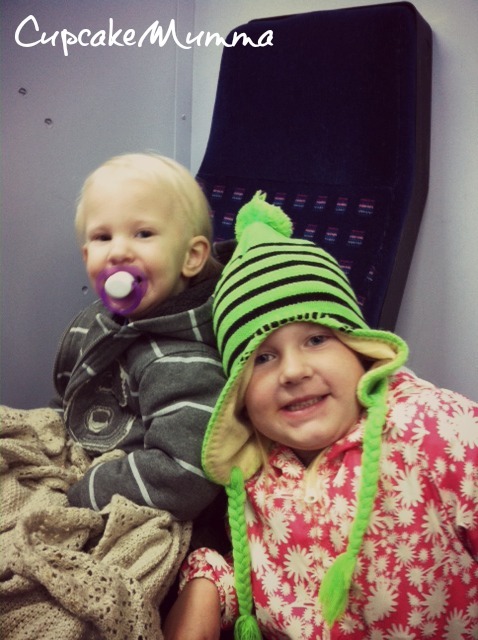 I love looking through my old photos and seeing just how much my two beautiful children have grown. The photo above is when Little Man was only a couple of months old. He was finding his little voice. You know, when they make high pitch screeches or gnaw on their fists making that sweet little sound. Melts my heart! I've been doing a fair bit of crafting which has kept me busy. Crafting always makes me happy! It's October. It's Autumn. It's nearly birthday! So many reasons to feel cheerful! I'm really looking forward to Halloween. I've got a bag full of stuff to decorate the house with and am now planning food and crafts to finish things off! My Mum has left her job. This is a reason to be cheerful because she was not happy at all. She'll be unemployed now for a few weeks before starting her new job. 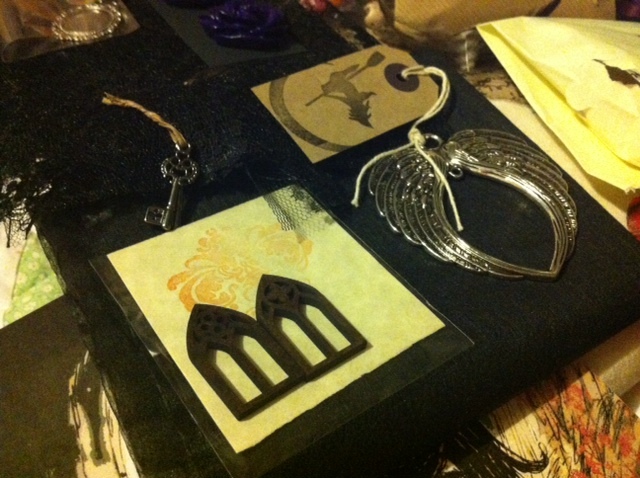 I've got some lovely things coming to me in the post. I love getting mail! Finally, my sister has settled in really well at university so I couldn't be happier for her.